Welcome to EPSA’s blog about EPS pods and waffle raft slabs. We know many people, be it home owners, builders or do-it-yourselfers are interested in keeping up-to-date with innovative materials and methods. So, to answer your calls, we have established this waffle raft blog, which will be updated in weekly instalments. Over the weeks we will address EPS pod and waffle raft slab basics, what they are, where they come from, why they are popular, how they add value, as well as construction and specifications. Waffle raft slabs, How to construct waffle raft slabs, EPS, The benefits of waffle raft slabs. Waffle raft slabs are a better way of building concrete slabs for new homes, extensions and commercial or industrial buildings. 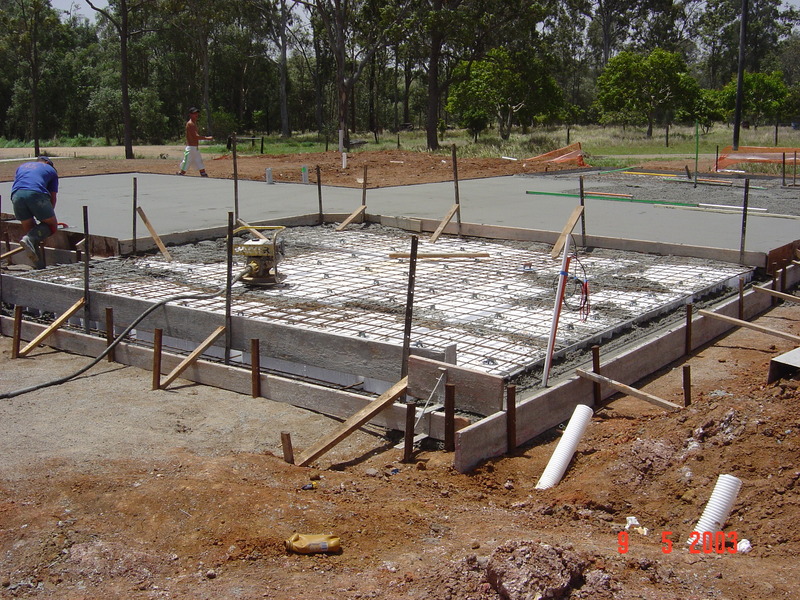 They create an on-ground – rather than traditional in-ground – reinforced slab, working on a simple levelled building surface without the extensive trenching and site preparation required for traditional concrete slabs. Before we get into the nitty-gritty, it is important to clarify pods are the singular EPS square (hollow) blocks that are evenly spaced within the constructed edge boards, evenly spaced (with plastic spacers), reinforced with steel mesh and covered with concrete. The end product is a waffle raft slab. EPS is a cellular material, and is essentially 98 per cent air, creating a versatile building material with many advantages including being light weight, strong, durable and economical. The pods are created by placing conditioned expanded EPS beads into a mould, then heated with steam. After cooling, the pod is removed from the mould as a square block with a flat deck and a moulded cell base (which has a honeycomb pattern). Pods are a uniform dimension (nominal) 1090mm (L) by 1090mm (W) with different depths to choose from, depending on the needs of your building site, which is specified by the architect, builder and the results of the soil test. Reactive soils are clay-based and swell and shrink on wetting and drying, creating movement and instability. For more reactive soils, deeper pods, providing a stronger slab, will be specified. 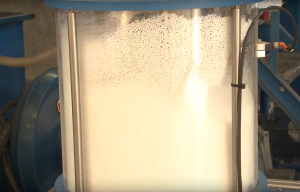 To watch a short video on how pods are manufactured, click here. Waffle raft slabs were initially used in South Australia as an economic solution to cracking of traditional slabs on reactive soils. On sites with highly reactive soils, traditional concrete slabs need a series of excavated footings, and deeper trenches into which concrete is poured. This is to stabilise the slab beneath the building. 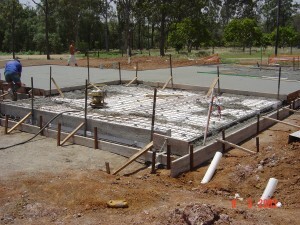 This results in more concrete being used, as well as an increase in labour to prepare the site for the concrete pour. By sitting on the ground rather than in it, waffle raft slabs provides a way to save cost on construction while still maintaining strength, but waffle raft slabs can even provide savings on building sites where standard footings are appropriate. The waffle raft slab is engineered to be stiff enough for the entire slab to move like a raft (floating above the surface), and to not crack even if one section of the slab is pushed up by ground heave. So you can be sure your brickwork and plaster will not crack. So, the construction of waffle raft slabs is quicker and more cost effective than traditional concrete slabs because less concrete is required and the pod system complies with all relevant Australian Building Codes and Standards. There are many other benefits to using pods to construct slabs which will be discussed in further instalments of this blog. Let’s look at the basic steps of how to build a waffle raft slab, than explain some of the finer points, so we can better understand their benefits. Place reinforcement steel between and mesh on top of pods elevated by plastic “bar chairs” or similar. A critical element to construction is that the slab designer constructs the slab according to engineering principles, and can only be specified once your soil has been tested and pod thickness determined. 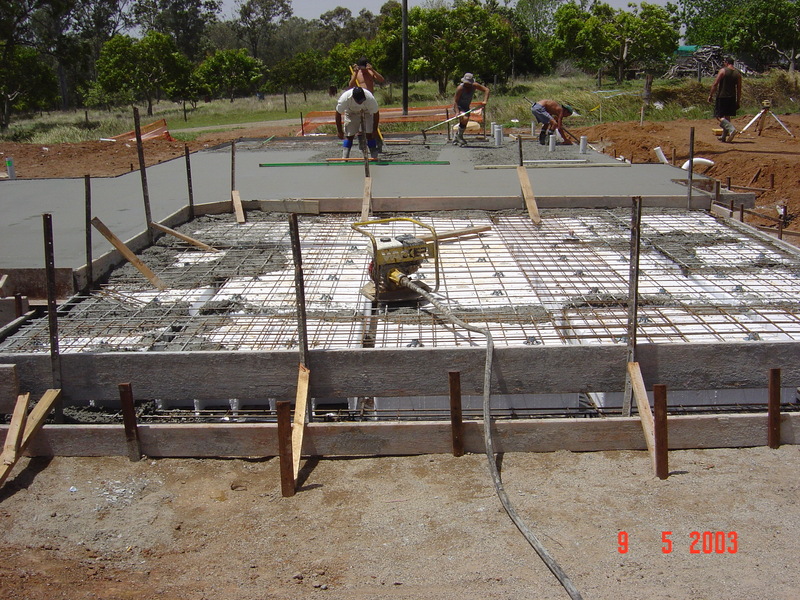 Ground preparation is reasonably important but no more so than when building a traditional concrete slab. However, drainage is critical for all slab types. Care needs to be exercised in selecting the type of fill that is used around the slab. There is potential for both traditional concrete and waffle raft slabs to have the ground around and underneath them washed away. Gardens should not be planted against any type of slab as the roots can grow under the slab and cause local ground movements. Also, trees and plants take moisture from the soil, while trees leave gaps under slabs as the wood rots. Edge boards, pods and plastic spacers are set out within the perimeter of the slab prior to the concrete pour. The pods are placed with their moulded cell or cavity side side facing down. Once the concrete has covered the laid out pods, this system creates a grid of concrete ribs under the waffle pattern. The result is a structural element of immense strength which is highly resistant to twisting and cracking, even on the most reactive soil. Because there are no trenches that could fill up with water or collapse in rain, waffle raft slabs can be constructed in all but the most adverse weather conditions, meaning delays due to rain will be reduced. When using pods, accuracy is guaranteed, because unlike traditional slabs there are no trenches to fall in and change shape, resulting in fewer rejections by building surveyors. As well as this, they reduce waste and provide substantial boosts to building site efficiency. There is also minimal impact on the environment – with less soil disturbance and no excavated rubble from trenches to dispose of. The on-ground slab, with air pockets created by the pods’ moulded cell base, forms an insulating layer between the ground and the house. Waffle raft slabs can be used in all types of conditions around Australia. In cooler climates it provides thermal insulation, while in hotter climates it does not contribute to cracks. Areas prone to tropical storms are not a problem as waffle raft slabs can be used in conjunction with cyclone-proof designs. 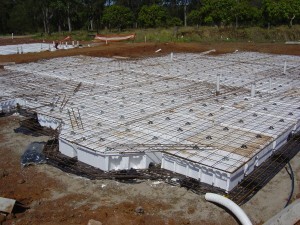 To view a short video of a waffle raft slab being constructed, click here. The EPS used in waffle raft slabs is more-or-less the same material used in packaging around the world. It’s 100 per cent recyclable and does not produce any greenhouse or ozone-depleting gases. EPSA strongly recommends the use of raw material with a flame retardant additive. 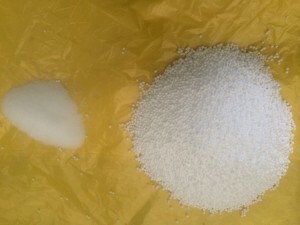 EPS is manufactured from styrene monomer. Low levels of styrene occur naturally in many plants, fruit, vegetables, nuts and meat. 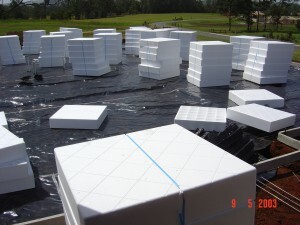 Where does expanded polystyrene come from? EPS was discovered in Germany over 50 years ago and today is used extensively in construction around the world. In 1839, a German apothecary Eduard Simon discovered styrene, although Simon was able to isolate the substance from its natural resin, he did not know what he had discovered. It wasn’t until 80 years later that organic chemist Hermann Staudinger, created a plastic polymer comprised of long chains of styrene molecules. In 1953, Staudinger won the Nobel Prize for Chemistry for his research, by creating materials manufactured through the thermal processing of styrene, which were similar to rubber. These included polystyrene. In 1930, scientists at BASF developed a way to commercially manufacture polystyrene in a pellet form. In 1937, the Dow Chemical company introduced polystyrene products to the U.S. market. Then in 1951, BASF developed and patented expanded polystyrene under the trademark Styropor®. Today, EPS is one of the most versatile and cost effective materials for both packaging and building/construction applications, because of its benefits in product, performance and recycling. In commercial manufacturing, EPS is a derivative of ethylene and benzene, and is made using a polymerisation process which produces translucent spherical beads of polystyrene, about the size of sugar granules. During this process, a low boiling point hydrocarbon, usually pentane gas, is added to the material to assist expansion during subsequent processing. EPS then goes through a a three stage process. Pre-expansion – upon contact with steam, the pentane gas or other pre-foaming agent within the polystyrene beads starts to boil and the beads are expanded up to 40 to 50 times their original volume. Conditioning – after expansion, the beads undergo a maturing period prior to moulding. Moulding – the beads are then transferred to a mould and again reheated with steam. The pre-foamed beads expand further, fusing together under pressure. The beads are moulded to form large blocks for cutting and shaping or customised products such as produce boxes or pods. The finished product is approximately 98 per cent air. EPS is used in a huge variety of industries such as packaging, building products and car manufacturing. It can be recycled into photo frames, coat hangers and imitation wood. As we’ve been discussing, EPS pods have contributed to a revolution in slab construction methods, enabling stronger, better-engineered slabs to be designed and constructed faster and more economically compared to traditional methods. Waffle raft slabs have been designed to provide many benefits. They reduce the effects of soil movement, decrease the amount of concrete required, and have thermal insular properties making them a cost effective component for any home, building or complex. In traditional slabs, the bottom of the slab uses footings based on concrete beams which require extensive digging. As well as the manual labour involved, there is the challenge of accurately specifying how much concrete is needed, due to over or under excavation of the site. Also during wet weather, trenches and steel need to be kept clean adding to the cost of construction. The pods are light weight and uniform, suitable for a range of residential, commercial and industrial settings and applications. EPS pods are unaffected by water and constructing waffle raft slabs is safer than the alternative, as there are no trenches to cave in during construction or rainy weather. This also limits the uncertainty of completion time due to wet weather. 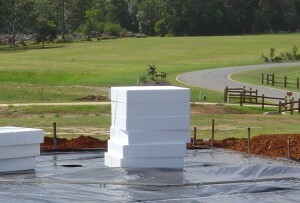 The inclusion of pods in a slab adds an insulation benefit of up to R1.0 (W/mK Thermal Resistance). While making the house warmer in winter and cooler in summer, this also contributes to a reduction in the overall energy consumption of the house. The use of pods also increases slab strength and by having the slab above ground it avoids most difficulties in cutting and filling soils. We think waffle raft slabs are the best bang for your buck when it comes to building and construction. There are just so many benefits. Pods have a long term R-VALUE (thermal insulation). EPS has a low water absorption. EPS is 100 per cent recyclable – hundreds of tonnes are recycled each year in Australia. EPS products are inert; no toxic issues. EPS building products produce no ozone depleting gasses. EPS does not contain or use chlorofluorocarbons (CFC’s). Pods are made in specialty machines. Pods comply with all relevant Australian Building Codes and Standards. Creating waffle raft slabs mean less site works thanks to no trenches needed. The cracking of foundations and constructions is reduced when waffle raft slabs are used. Waffle raft slabs mean time saved and greater efficiency. 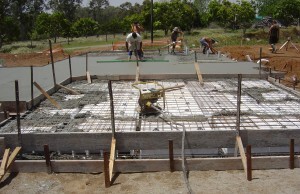 Construction of waffle raft slabs is lower in cost than traditional concrete slabs, especially on reactive soil sites. Work on waffle raft slabs can continue in adverse weather conditions. Waffle raft slabs offer simplicity of construction thanks to the use of interlocking components (spacers). Pods give you better insulation from ground and less environmental disturbance. EPS being an inert material, does not rot and provides no nutritional benefits to vermin therefore does not attract pests such as rats or termites. Using pods gives you the ability to design a slab easily. Thanks to the very precise layout of pods, the amount of concrete used can be more accurately estimated with less waste than a traditional concrete slab. The laying of the plastic sheet is easier and quicker without footings. Plumbing can be easily passed through pods with the use of a handsaw. EPS is clean and easy to use. We hope this blog has been informative and that we’ve been able to answer your waffle raft slab questions. If you would like more information on pod slabs, would like to contact a producer of pods, or have any more questions, please email admin@epsa.org.au or call (03) 6281 2320.